Heat waves could significantly reduce crop yields and threaten global food supply if climate change is not tackled and reversed. This is according to a new study led by researchers at the University of East Anglia and published today, 20 March, in IOP Publishing's journal Environmental Research Letters, which has, for the first time, estimated the global effects of extreme temperatures and elevated levels of carbon dioxide (CO2) on the production of maize, wheat and soybean. Earlier studies have found that climate change is projected to reduce maize yields globally by the end of the century under a "business as usual" scenario for future emissions of greenhouse gases; however, this new study shows that the inclusion of the effects of heat waves, which have not been accounted for in previous modelling calculations, could double the losses of the crop. Lead author of the study Delphine Deryng, from the Tyndall Centre for Climate Change Research at the University of East Anglia, said: "Instances of extreme temperatures, brought about by a large increase in global mean temperature, can be detrimental to crops at any stage of their development, but in particular around anthesis—the flowering period of the plant. "At this stage, extreme temperatures can lead to reduced pollen sterility and reduced seed set, greatly reducing the crop yield." The impacts on wheat and soybean are likely to be less profound, primarily because of the fertilisation effects that elevated levels of CO2 can have on these crops. In plants, CO2 is central to the process of photosynthesis—the mechanism by which they create food from sunlight, CO2 and water. When there is more CO2 in the atmosphere, the leaves of plants can capture more of it, resulting in an overall increase in the biomass of the plant. In addition, plants are able to manage their water use much more efficiently in these conditions, resulting in better tolerance to drought episodes. However, it is not clear whether these CO2 fertilisation effects will actually occur in the field owing to interactions with other factors. If the CO2 fertilisation effects do occur, the researchers found that the yields of wheat and soybean are expected to increase throughout the 21st century under a "business-as-usual" scenario; however, the increases are projected to be significantly offset by the effects of heat waves, as these plants are still vulnerable to the effects of extreme temperatures. The positive impacts on soybean yield will be offset by 25 per cent and the positive impacts on wheat will be offset by 52 per cent. The researchers, from the Tyndall Centre for Climate Change Research (University of East Anglia, Norwich), Grantham Research Institute on Climate Change and the Environment (London School of Economics and Political Science, London), and Global Environmental and Climate Change Centre (McGill University, Montreal), arrived at their results using the global crop model PEGASUS to simulate crop yield responses to 72 climate change scenarios spanning the 21st century. 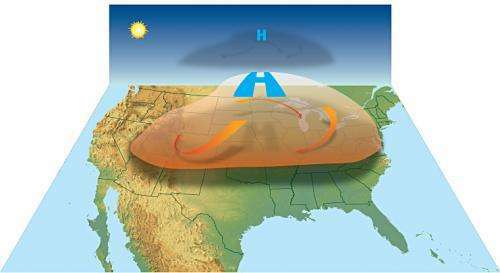 The study also identified particular areas where heat waves are expected to have the largest negative effects on crop yields. Some of the largest affected areas are key for crop production, for example the North American corn belt for maize. When the CO2 fertilisation effects are not taken into account, the researchers found a net decrease in yields in all three crops, intensified by extreme heat stress, for the top-five producing countries of each crop. "Our results show that maize yields are expected to be negatively affected by climate change, while the impacts on wheat and soybean are generally positive, unless CO2 fertilisation effects have been overestimated," continued Deryng. "However, extreme heat stress reinforced by 'business-as-usual' reduces the beneficial effects considerably in these two crops. Climate mitigation policy would help reduce risks of serious negative impacts on maize worldwide and reduce risks of extreme heat stress that threaten global crop production." Climate change: A promising future for cotton in Cameroon? There is only medium confidence that the length and frequency of warm spells, including heat waves, has increased since the middle of the 20th century mostly owing to lack of data or of studies in Africa and South America. However, it is likely that heatwave frequency has increased during this period in large parts of Europe, Asia and Australia. If you read further, the report notes that heat waves in the United States have decreased since the 1930's. So much for "medium confidence"; more like low confidence. It cannot be stressed enough that basing predictions on inaccurate models leads to meaningless results. But aksdad we have moved on to an era when real world evidence is no longer important in science. When climate scientists talk of consensus they are talking about consensus of opinion rather than actual evidence. Besides, If the models aren't working you can always go back and adjust the data. We can also completely ignore the danger to food supply that could result from a future little ice age. Can you say "Soylent Green"? More and more, scientific observations are suggesting that a global warming food shortage is highly likely. You deniers (including most of the republican party) are idiots to still maintain the position that global warming is not occurring, is not man-made, or cannot be stopped. The last one maybe true, we might already be over the tipping point of "cannot be stopped". CO2 surpassed 400ppm in it's last measurement. "Fierce solar blasts that could have badly damaged electrical grids and disabled satellites in space narrowly missed Earth in 2012, U.S. researchers said on Wednesday. The bursts would have wreaked havoc on the Earth's magnetic field, matching the severity of the 1859 Carrington event, the largest solar magnetic storm ever reported on the planet. That blast knocked out the telegraph system across the United States, according to University of California, Berkeley research physicist Janet Luhmann. "Had it hit Earth, it probably would have been like the big one in 1859, but the effect today, with our modern technologies, would have been tremendous," Luhmann said in a "
Call us old fashioned but we need evidence Howhot. evidence of global warming? Really? if you are referring to something else, feel free to add it or clarify yourself. This is primarily from people who don't have a university education in Physics & cannot appreciate the conjunctive & combinatorial complexity of increased heat in the system & the ongoing need for wider/deeper temperature measurements. as part of their training. they ask where is the HEAT going ? heat is going & confirmed by more melt water & confirmed by reducing salinity, too complex ? So many people just cannot understand the significance of the fact that as you add heat to a glass of ice water the temperature doesn't change. And the few that do then cherry-pick surface ice data and other misleading distractions. I pick asteroid impact for 20 Jack. Nothing like a good disaster to really make people aware of what we have in common. The disaster that is approaching us, the rapid climate change from CO2, is currenrlly slow in measurable consequence, is difficult to notice by people. It's like slowly boiling a frog. I saw Mann has just claimed that by 2036 we could see a 2.5C temperature above current global average temps. He's a pretty smart fellow and I agree with him. I have always tended to think the higher temp predictions are more likely scenario. The "Soylent Green" scenario in 2036-2050 is so real for some areas around the globe, it's a frightening future. And it's not just mankind, its the whole eco-system effected! This is far more serious than the Debt. Cap Stumpy gave you all the evidence you would need, but of course your brain is so small and poisoned by fox news, you don't know how to read. Do you? Only the foolish, the dim-bulbs, and the republican dupes don't see the evidence of global climate change. CO2 is 400ppm now. The polar bears will drown or move south. A study by the UEA published in Environmental Research Letters tells us 'It's worse that we thought!'. Quelle suprise. as you add heat to a glass of ice water the temperature doesn't change. It will when the ice melts. Corn is very poor in nutrition, so "good riddance maize!" It's time to plow Siberia anyway. As the mass of ice asymptotically reaches zero, areas of water will warm up & and change current flows over a period of time. Isnt this what we are seeing now re the sea with reduced salinity ? So ryggesogn2, why don't you factor that and your comment into the climate system, we have a lot of ice that has been absorbing heat and reaching the point of melting - where the temperature DOESNT rise, basic physics of properties of water. So obviously when this ice/water melt contacts atmosphere it REDUCES atmospheric temperatures in relation to shifting equilibria whilst NOT increasing the temp of the ice/water until the vast bulk of ice has melted. So its obvious this buffer, from the Known properties of water, show simply you can have an increase of heat in the system whilst there are reductions in temperature. Why ryggesogn2, can't you see that, it's comparatively simple. U still claim to have a physics degree ? So where do the predictions of more--and worse--heat waves come from?. When you are a cult, you create your reality to match your intentions. AGWites keep saying the ice is melting so there is less ice to absorb heat on the earth. You say the 'missing' heat is now being absorb by ice. But... if there is less ice now than 15 years ago, how could the ice be absorbing all this 'missing' heat? NeoFascistCons keep saying the ice is building so there is more ice to reflect cold from earth. You say the 'found' cold is now being rejected by ice. One goofy argument deserves another. ryggesogn2 Proves AGAIN he LIED re Physics Degree with this SIMPLE question, any first year students know THIS !!!! Evidence Ice is warming, absorbs heat long before melting. Evidence of melting ice, absorbing MASSIVE AMOUNT (331J) of heat becoming water ! Just because there's less Ice doesn't mean it stops absorbing heat or melting !?? Is that understood NOW ryggesogn2 ?